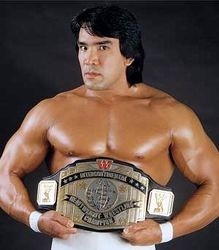 Richard Henry Blood, Sr. (born February 28, 1953) is an American professional wrestler, better known by his ring name Ricky "The Dragon" Steamboat. He is known for being one of the few wrestlers to have stayed a Face for his entire twenty year career. Awesome McCool Name: Just look above, the only reason he didn't use it when wrestling is that "Richard Blood" doesn't suit a career Face too well. But Not Too Foreign: Steamboat is of mixed ascestry, having been born to an English father and a Japanese mother. Corpsing: In the profile for the Brisco Brothers (Jack and Jerry) in the book The Pro Wrestling Hall of Fame: The Tag Teams, while discussing his and Jay Youngblood's matches with the Briscos, said, "You would not believe the number of times I had to stop from laughing. I'd be in the corner covering my mouth, but you could see my belly bouncing up and down." The Dragon: His Red Baron. The Dreaded: This mild-mannered, soft spoken lifetime babyface manages to scare his heel opponents shitless. He's that good. Early Installment Weirdness: Didn't use "The Dragon" Red Baron until his first WWF run, though he retained it for the rest of his career. Enemy Mine: With The Prophecy vs The Second City Saints in Ring Of Honor. Then with the Second City Saints vs Generation Next. Then with Mick Foley vs The Carnage Crew. He actually wanted to turn heel a few times, but bookers were unconvinced that he fans would buy him as a bad guy. He was reportedly told that even if he went out there with a chainsaw and sawed Hulk Hogan's arms off, the fans still wouldn't buy it. In fact, he's so likable that his real name (Richard Blood), an easy to use ring name, was changed to match his personality. Flanderization: Originally nicknamed "The Dragon" due to his physical similarity to Bruce Lee. When he came back in 1991, he became an anthropomorphic dragon who breathed fire. Hope Spot: In American Pro Wrestling, this trope is most commonly referred to as "the law of Steamboat" or "the rule of baby face" and then credited to Ricky Steamboat. Even if it was completely ineffective, he'd always make sure to do something to at least let people know he was still trying to win. I Have the High Ground: Particularly known for his top rope cross body, a seemingly outdated move which became a lot more popular in WWE when he came out of retirement to wrestle Chris Jericho. Legacy Character: Of Sam Steamboat. Lighter and Softer: During his second run in the NWA after his stint in the WWF, he was well known for having his wife and son at ringside with him during his matches, portraying himself as a settled family man. This arguably worked against him, as the idea of the happily staid babyface was becoming passe in the early 90s and he spent most of his tenure feuding with Ric Flair, he of the fast cars and faster women, who despite being the heel had the far more entertaining gimmick. Lightning Bruiser: He was both incredibly agile and incredibly strong. Martial Arts Headband: For show mostly when doing promos, he rarely wrestled in it. Real Song Theme Tune: The Alan Parsons Project's "Sirius" in WWF, which is edited out in all modern media releases. Reasonable Authority Figure: In TNA, he was hired with the hopes he would be a reasonable one after a successive string of bad bosses and attempted company takeovers. He ended up being perhaps too nice. Recycled Soundtrack: "Dragon", the theme he's used since returning in 2009, was originally used by the Ultimo Dragon during his forgettable WWE run. The Reveal: Would often enter a territory as someone's unannounced tag team partner. Most notably, his classic 1989 series of matches with Ric Flair started when Steamboat (billed as "Mr. X") teamed with Eddie Gilbert against Flair and Windham at a TV taping. Flair's surprise at seeing his former archrival was a classic Nature Boy meltdown. Ring Oldies: Wrestled up to the age of 56, though he took a 15-year break before then. Ric Flair and Steamboat had a series of matches known as the "holy trilogy" both for how good they were and how much they drew in 1989. Of course, he and Ric Flair had feuded before that too. To Mick Foley in Ring of Honor, on whether the promotion should be showcasing more "pure wrestling" or "Garbage Wrestling". Signature Move: Top rope cross body. Still Got It: Steamboat made a return to active competition in 2009 when he feuded with Chris Jericho, facing him at Wrestlemania 25 and Backlash. And damn if he wasn't still able to impress and give Y2J a serious run for his money! Summon Bigger Fish: He used a Komodo dragon to chase off Jake Roberts and his python Damien. The South Pacific Connection, with Jimmy Snuka in WWE. Charlie Brown from Outta Town: Los Dos Hombres, in mid-1993 WCW. It was supposed to have been Steamboat and Douglas under masks against the Hollywood Blondes ("Stunning" Steve Austin and "Flyin'" Brian Pillman), but Douglas had left/quit/been fired and Brad Armstrong was the second guy. For the cage match at WCW Slamboree 93, it was Tom Zenk. Take That! : He had an issue with Ron Killings in TNA, but when Ricky Steamboat tried to put Killings in his place, Ron Killings instead ran down Ricky Steamboat's WWF career and stated based on his wrestling ability alone Steamboat should have been WWF Champion but was held back for things he could not help. (basically, being an Asian man) In response to this, Steamboat gave Killings a shot at the NWA World Heavyweight Championship. Underwear of Power: Before switching to long tights in the mid-1980's. Worthy Opponent: CM Punk, Colt Cabana and Ace Steel, the Second City Saints. It did not start out that way, Punk trying to make history at Steamboat's expense but they eventually reach the point where they teamed up together against Generation Next in Ring Of Honor. Wrestling Family: His brother Vic was also a professional wrestler. His son is a wrestler in WWE's developmental territory of FCW.